Like I said a while back, Kerwin Cuevas knows where all the bodies are buried. Probably would have helped to get Walker’s last name correct. Whomever put it together must have been thinking of a portrait hanging nearby of a previous governor. Does anyone know if this Sullivan person was actually hired? I could be mistaken but the name is not listed on the transparency website. If someone wanted to do a little digging, I would recommend examining all the contract workers around this period. I have heard a large portion of them were politically connected. Here is a quick list of contract workers that have alleged connections but are not 100% confirmed. Names shown multiple times indicate multiple or renewed contracts. Excuse the format if anything is goofy as it was cut from an Excel file. According to folklore, numerous other people on the contract list are rumored to be friends with W. Walker but have not been confirmed so they were not displayed. I am curious at this point as to how many DMR employees have been fired since these fools opened their mouths about the new law that went into effect exempting the DMR from oversight of the state personnel board? Nothing but a Radical Republic Smoke Screen I say. Also, it seems kind of funny that the SH does not have these stories listed anymore. Were they removed? The Sun Herald reported there were some Byrds at the DMR. 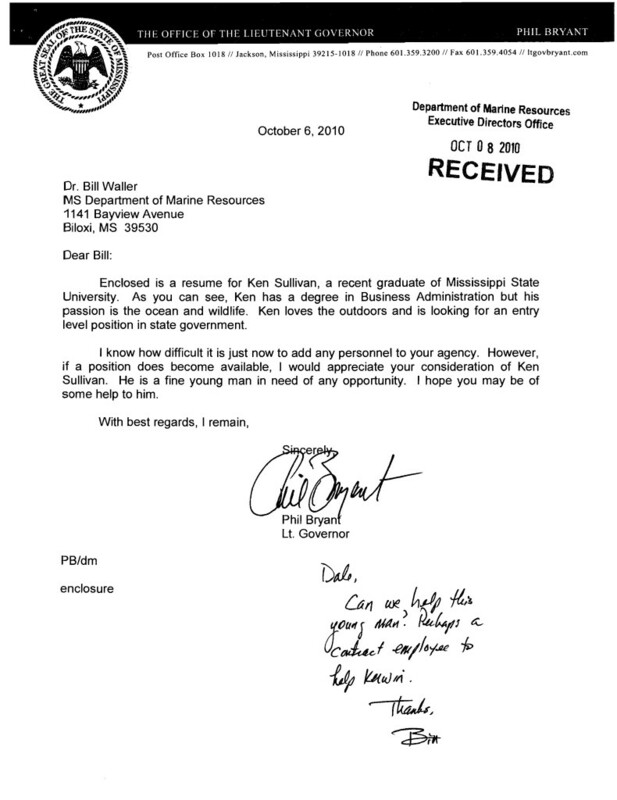 Biloxi attorney Robert Byrd helped Walker set up the Marine Resources Foundation, which owns boats DMR leases and has paid to run. They are neighbors on Pine Hills Road. State records show Byrd’s two sons and his brother Paul Byrd were employed as contract workers in 2008. One son worked a couple of summers. The other son, Colin Byrd, still works for DMR. The Sun Herald found Colin Byrd outside his Ocean Springs home Wednesday afternoon, washing down a charter boat after an offshore fishing trip. He said the charter-boat service is his full-time business, but he works when needed for DMR. His job at DMR is to provide construction assistance for the sea trout program at Cedar Point. The contract job has paid him $46,200 for fiscal year 2012, state records show. Byrd said he builds “specialty stuff,” but he did not want to talk about his DMR work or how he got the job. He said his father did not get it for him. Colin Byrd’s uncle could not be located. He was not at the Lyman Fish Hatchery, where his contract says he performs various duties — construction assistance, general grounds and facilities maintenance and fish stock work — when the Sun Herald visited Tuesday afternoon and called Wednesday. Paul Byrd was paid $86,520 in 2012, more than the $86,382 salary of DMR Chief of Staff Joe Ziegler Jr.
Maybe this is the mystery Byrd son? Maybe not. Made a phone call to my friend in Ocean Springs about the wedding photos of Scott Walker’s friends.Taylor Bryd is the other Byrd son that was employed at the DMR. Some of the others pictured in the wedding party are also interesting. Trey O’Bryant is known to be an expert in sports betting and Scott Walker’s bookie, Dax Pitalo works with Trey and was a passenger on the plane with Scott Walker that crashed in Jackson County. Also wonder how many charter trips were booked on the Colin Byrd boat by Bill Walker?